The Online Applications will accept from 24th March 2017 to 10th April 2017. Candidates are supposed to refer eligibility criteria details and then apply for SBI Relationship Managers Vacancies. Especially relevant details like selection process, application fee and pay band will make available here. State Bank of India (SBI) is a Public sector banking and financial services company. It is the largest Bank in India having 13000 branches including 190 foreign banks across the world. The Headquarters is located at Mumbai, Maharashtra. 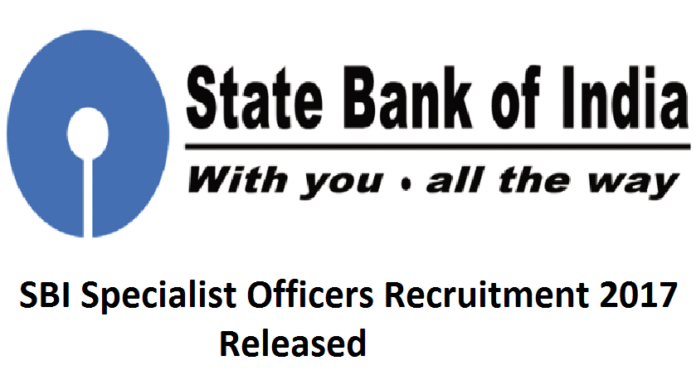 As per this information, right now they have released SBI Specialist Officer Recruitment 2017. There are 255 posts for Relationship Managers, Customer Relationship Executives, Investment Counsellors, Acquisition Relationship Managers, Central Research Team, Sales Head, etc. The Minimum Educational qualification should be MBA/PGDM or Graduation from reputed colleges and Minimum three year’s experience and for post wise details refer State Bank of India Officer Specialised Notification 2017. The age limit should be minimum 20 years to Max 52 years. The vacancies will allot in different places like Ahmedabad, Bengaluru, Bhopal, Chennai, Delhi, Hyderabad, Kochi, Mumbai, Pune, Thiruvananthapuram, Kolkata, Chandigarh and Indore. Candidates willing to apply may download SBI SO Online Application 2017 from official web portal at sbi.co.in, fill the details and submit through online before April 10 and duly filled application must send before April 13. Use the active link of SBI Specialist Officer Recruitment 2017 that has given below. The selection process is Personal Interview, Experience and Merit List based. For Latest Updates follow techfactslive.com and get more information like recruitments, admission and board results.